I have discovered the best crepes in London and they are only a stone’s throw from my local stomping ground in North London. 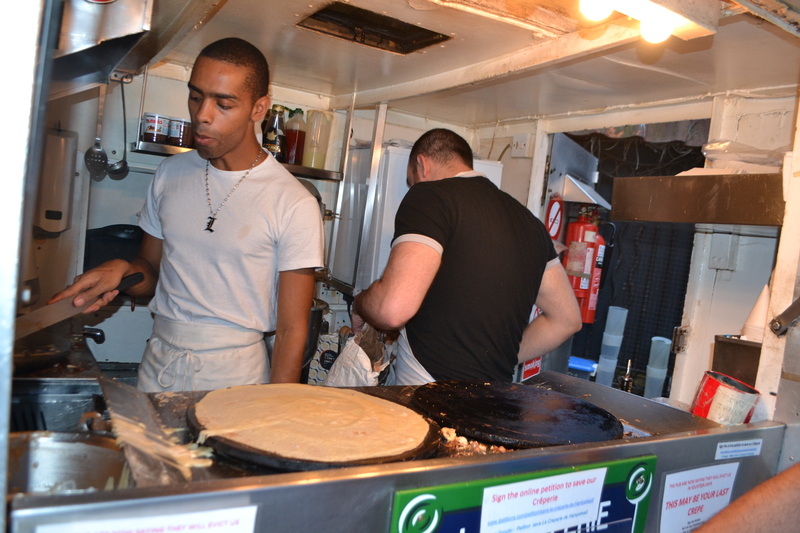 The tiny Parisian style crepe van in Hampstead has developed a cult following in the local community for the past 32 years. 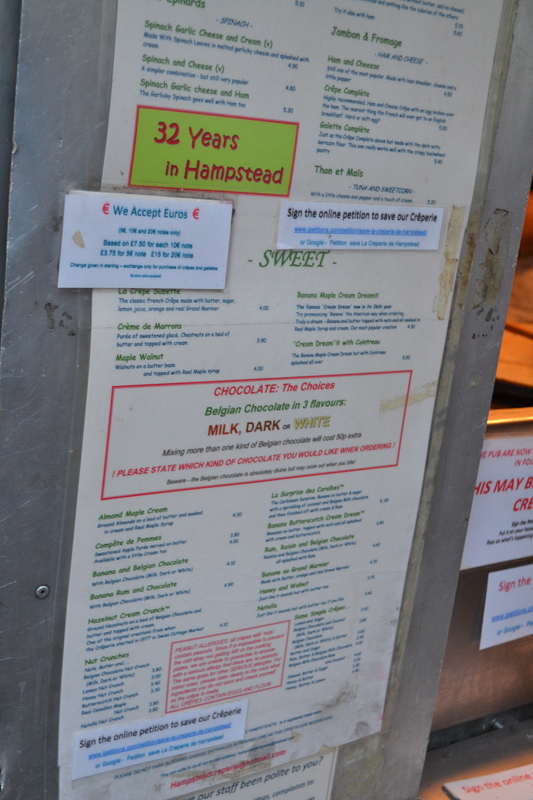 La Creperie de Hampstead has been based in Hampstead High Street since 1980. 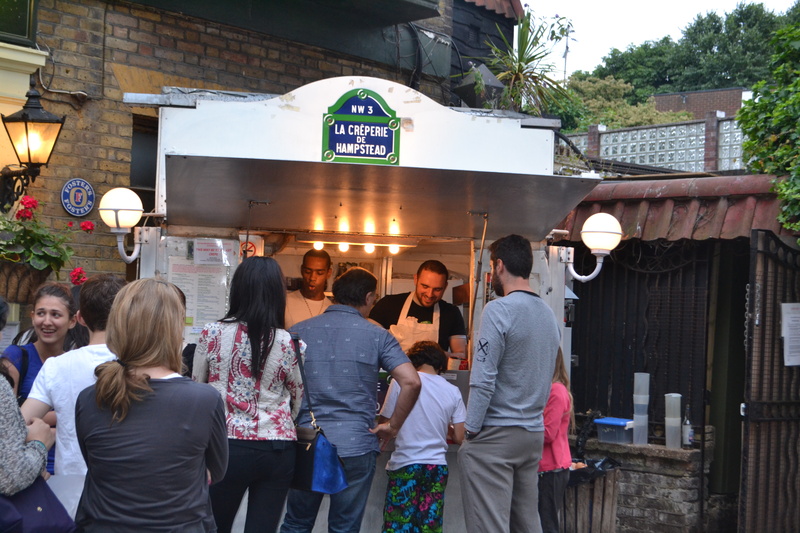 Serving a large selection of mouth-watering crepes and galettes, this local institution is never without a queue. For the sweet tooth there are simple crepes ranging from lemon and sugar and jam to the more decadent – belgian chocolate, banana and coconut and the french favourite crepe suzette. There are also savoury galettes including ham and gruyere cheese and mushroom garlic cheese. Although the queue can be long, the sheer efficiency of the two native French operators who use just two hot crepe irons is incredible. 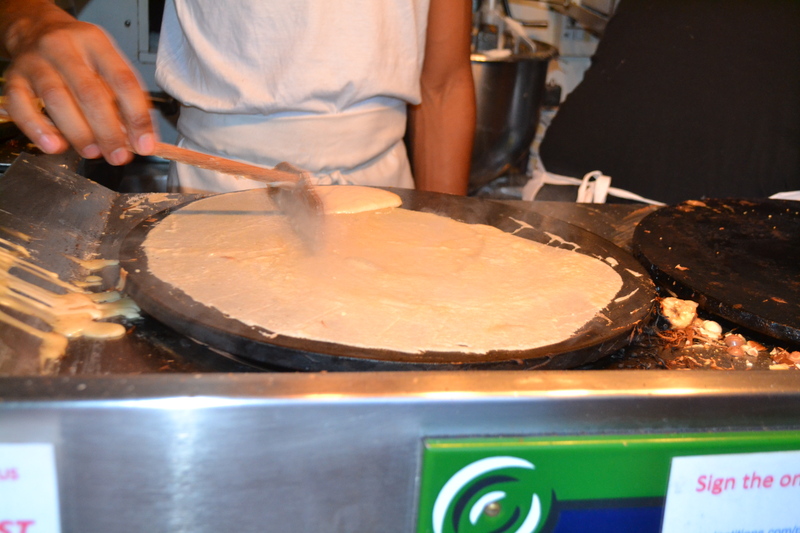 But the heavenly smell of the buttery sweet crepe mixture wafting down the queue can be torturous for hungry customers. If you are indecisive, come prepared and try to get a sneak peek of the menu before you get to the front of the queue – it is long. This time I settled on a simple favourite of mine – belgian milk chocolate. It is surprising that the french chefs can get any work done in their tiny claustrophobic kitchen. First comes the slab of butter to grease the iron and provide a non stick base for the crepe..
Then a small portion of crepe mixture is poured on to the iron and evenly spread out with a spatula until it creates an even thin layer. 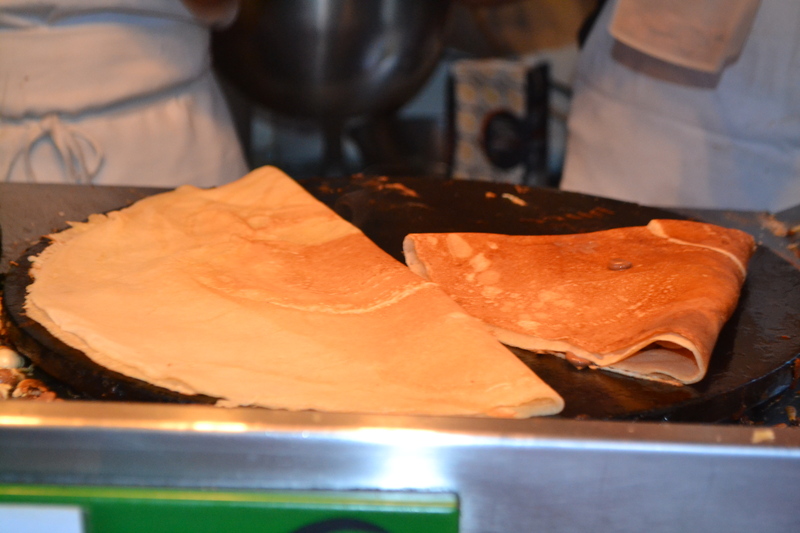 After the crepe has cooked through it is neatly flipped in half and topped with your desired toppings. I try to look away at this point when I see how much chocolate they put on. 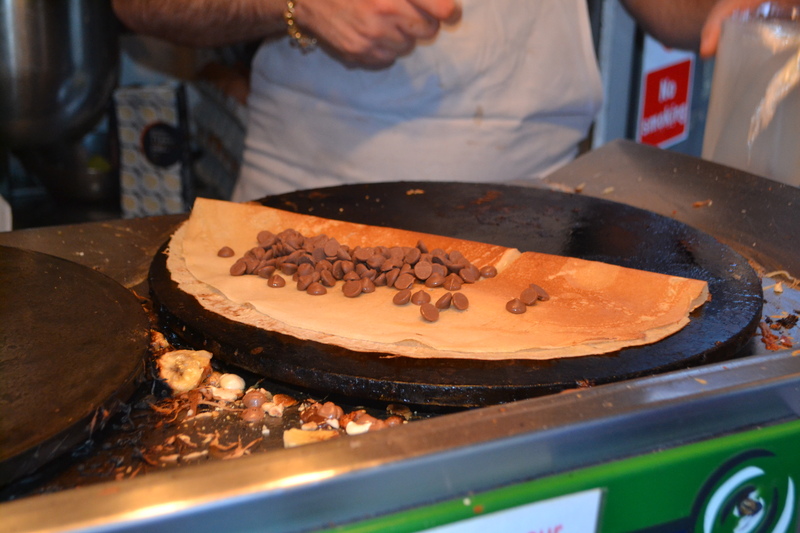 After the chocolate has completely melted, the crepe is nearly ready and folded for a second time.. 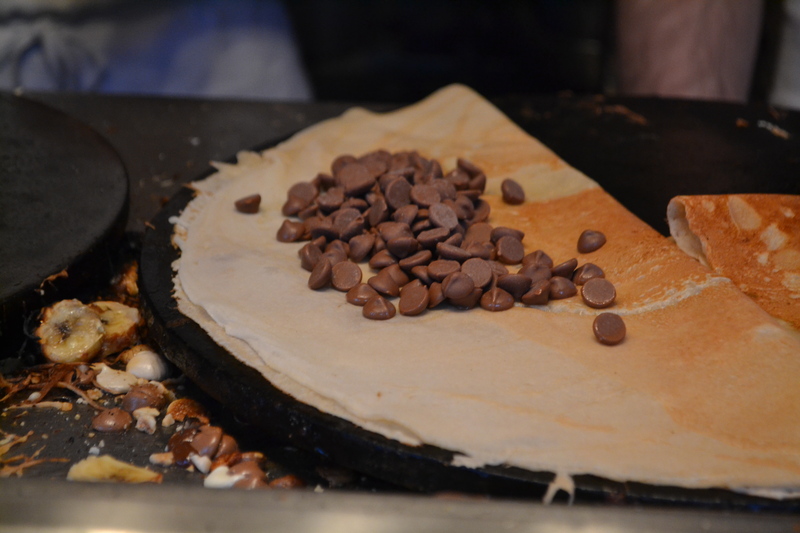 When golden brown and slightly crispy around the edges, the triangular parcels are then served in the creperie’s trademark white cones. And some very happy customers! 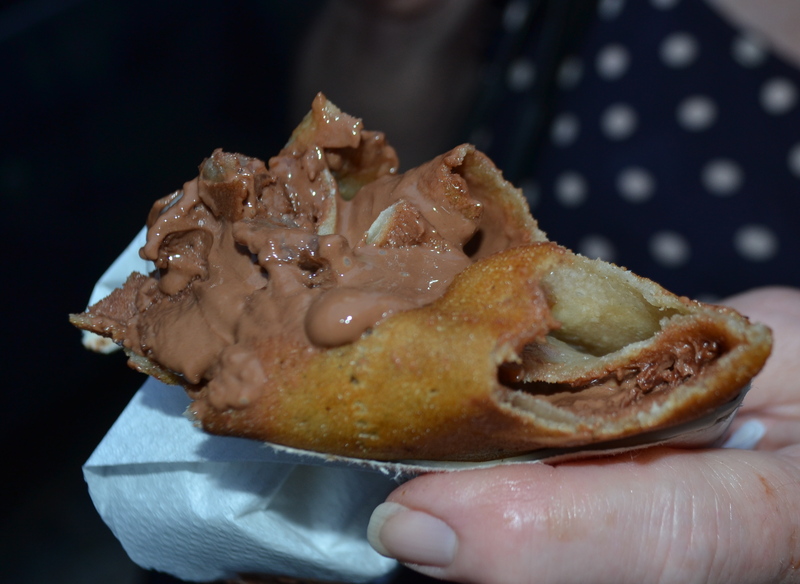 It can get very messy towards the end as the chocolate literally oozes out of the crepe. 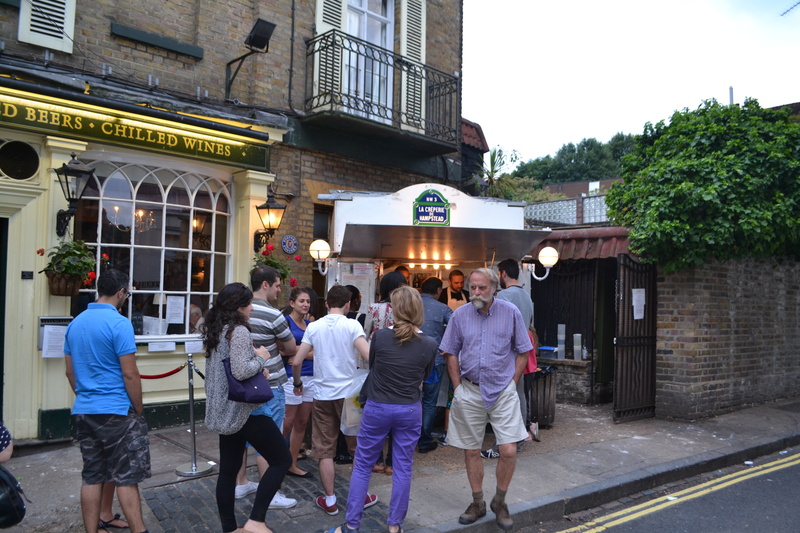 Unfortunately a bitter row has broken out between La Creperie de Hampstead and the King William IV pub next door that is threatening the livelihood of the creperie. Ham and High has covered the full story here. 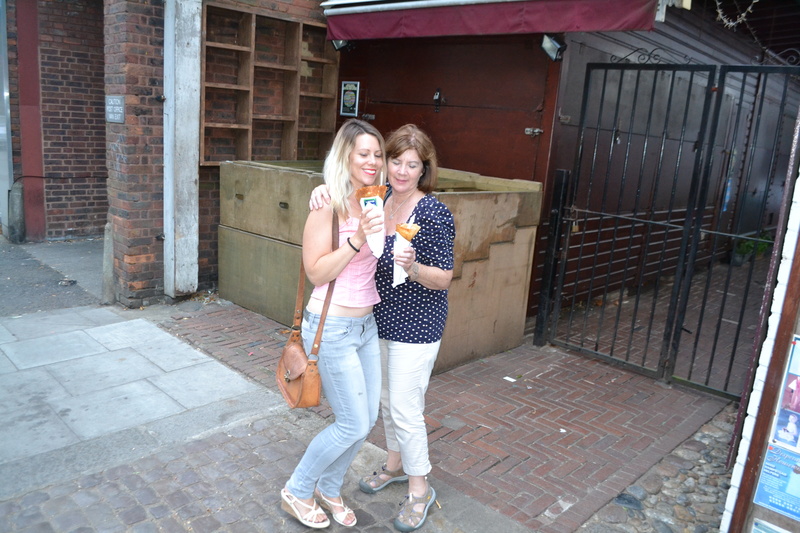 Let’s hope that the creperie survives – Hampstead wouldn’t be the same without it. 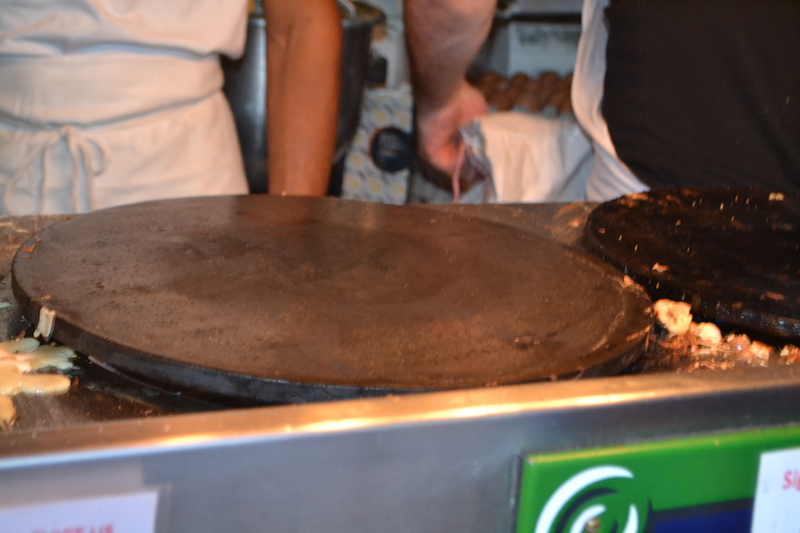 I would challenge you to find better crepes in London or anywhere in the world for that matter! 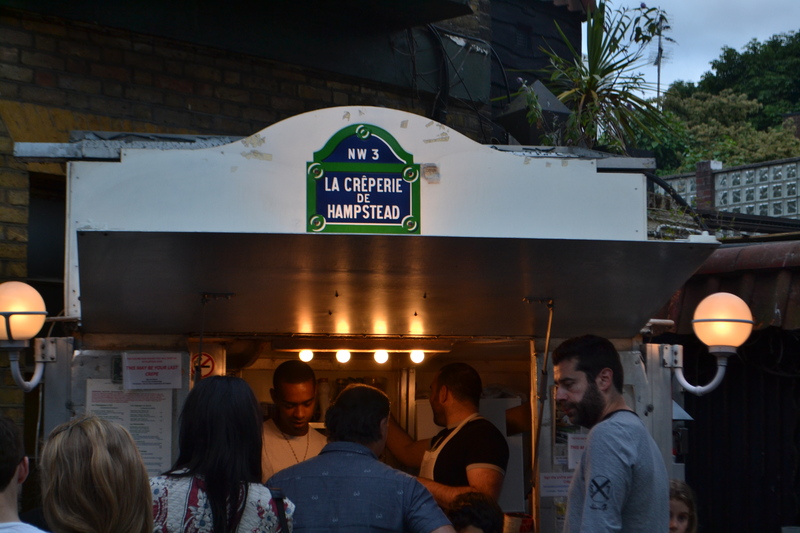 La Creperie de Hampstead is currently located on the corner of Hampstead High Street and Perrin’s Court a two minute walk from Hampstead tube station. Love that place! 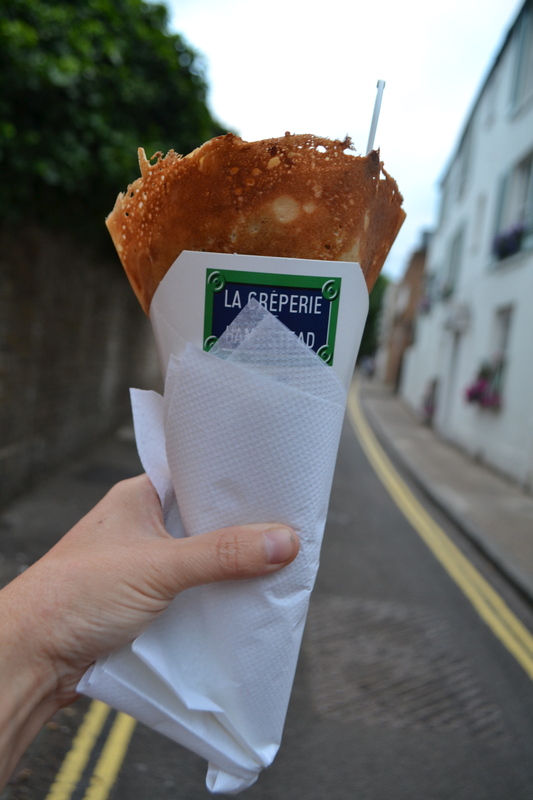 Used to live in the area and still miss the fab crepes! It is truly a unique thing, very pre-food truck times and still the best! you mean to say these were better than mine?! 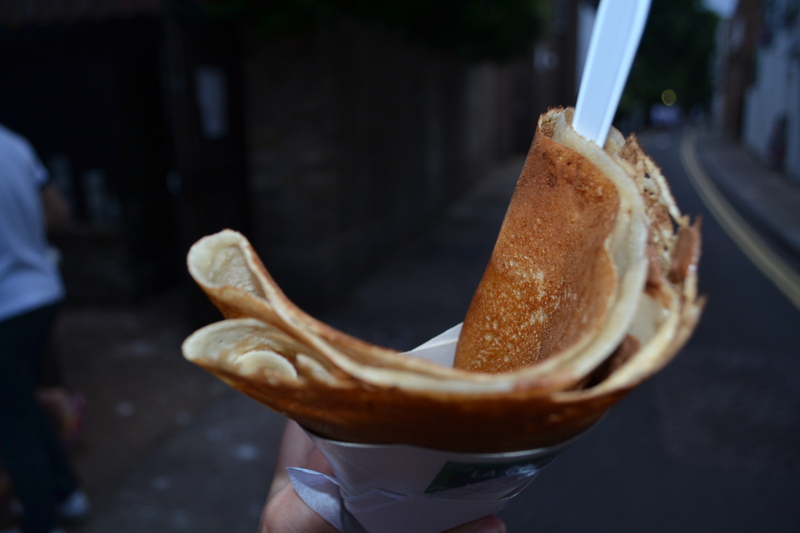 Lets, how about that fabulous crepe place in Hampstead everyone keeps carping on about?